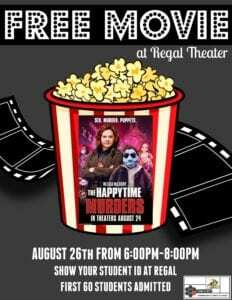 Students, go see a free movie at Regal Theaters — located directly across the street from campus — from 6 to 8 p.m. Aug. 26. Show your student ID at the theater for a free ticket to The Happytime Murders. The first 60 students to arrive will be admitted. PreviousGet involved: Run for office in the Student Assembly General Election!